The original cast recording is available on CD Baby, ITunes, Spotify– most anywhere you stream music! Well guess what? We were listening…and hope you will too. 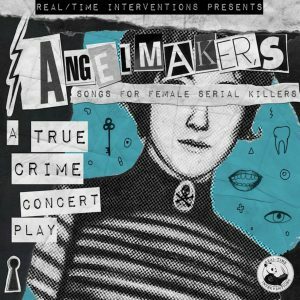 Presenting the original cast recording of ANGELMAKERS: Songs for Female Serial Killers! Featuring extraordinary Beirut-based singer/ actor Milia Ayache, guitarist/ bassist Zorahna (The F*ckies) and punk drummer Michele Dunlap (Murder for Girls), the album careens from punk-pop to country to Americana, illuminating the moments and motives of female serial killers throughout the ages. Available on CD Baby, the iTunes Store, Spotify– most anywhere you can purchase or stream music!